This new collection of 10 original songs pulls together Texas style blues, references to the British sound of Cream & Free and retraces its steps to the founding fathers of blues. But this isn’t your usual rock-blues album, with heavy rhythms and immaculate production setting the scene for big showy virtuoso solos. This album feels like the blues as it should be: Natural, rugged, spontaneous – and at times vulnerable. It’s not over constructed, heavily polished or over-engineered. It’s the raw, real deal – the way blues should be. In many ways there is a stripped back humility to this album. It’s not trying too hard, it just ‘is.’ This album is all about the mood. The album was mostly live recorded in Lemon Recording studio for that true bluesy sound and feel. I spoke with Pontus last week and he talked about the importance of his enduring relationship with his label ‘Off Yer Rocka’ in giving him total freedom to be spontaneous and capture real moments of magic. Somehow the essence of blues can be lost when things become over-scheduled, over-commercialised and over-produced. Pontus feels his label ‘gets’ him and trusts him to create the environment where he can do something a world away from the rocking craftsmanship and radio hits of Bonafide. One seems to be the antidote to the other. For this album, a full track-by-track assessment largely misses the point. This isn’t just a collection of songs. The whole album has a character and feel that is bigger than any of its parts. The music is visceral and it puts you in a frame of mind as the blues should. And many of the songs are very simple, but the soul behind great music can so often get lost in complexity. Pontus is well known as a rock singer, but his voice works perfectly for the blues and some of the guitar work on the album flies and sings with the freedom of a bird. As well as the original songs, the album also offers a very special cover of the Peter Green’s Fleetwood Mac classic ‘Jumping At Shadows.’ Other stand out tracks include ‘Believe’ – which opens with a flourish of AC/DC-esque chords and evolves into an uplifting blues anthem I can see working on radio. ‘Brothers and Friends’ takes the mind to sunnier times, with harmonica flourishes that sparkle. This song is full of mood and life, a song that pulls you in and takes you on an atmospheric journey as it steadily builds through in stages. ‘Raining In The Sunshine State’ again has an absorbing mood with echoes of Steve Lukather. And offsetting the mellow, laid back mood of much of the album, ‘Leaving This Place Behind’ reminds us that Pontis can pull out a nice boogie shuffle when he feels like it. ‘To Late To Die Young’ encapsulates the album – raw, stripped back, low-key perhaps – but real and very much alive. I’ve interviewed Pontus many times over the last four years. What is striking about him is his commitment to truth in the music he makes. He is his own man, he resists pretention for an approach to music that is genuine, direct and he doesn’t want to sound like someone else. He has a good outlook on life and with his music he lives in the moment. 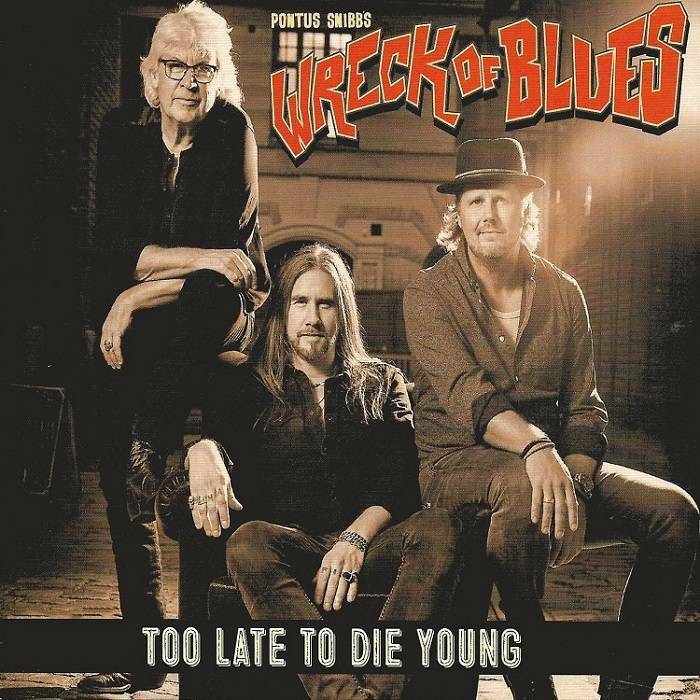 You couldn’t bottle that better than with a ‘Wreck of Blues’ album – and with ‘Too Late To Die Young’ we have a masterclass in less being more as Pontus Snibb takes blues back to its roots.